I can't imagine a more fun holiday party than a little gift exchange and soiree with all my girlfriends. Call me anti-boy if you want but I guess I just have more fun with my girls sometimes! Given the freezing temps in NYC right now I'd definitely opt for a jacket/pant combo for a party and night out, and what better thing to reach for than some embellished clothes? 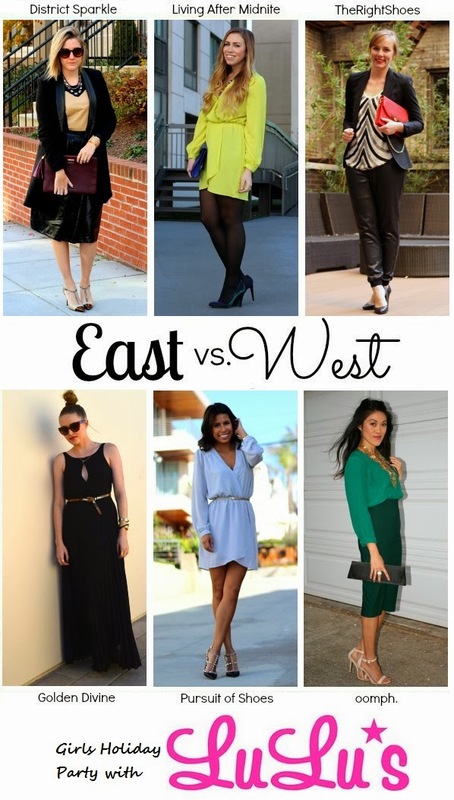 LuLu's has some great stuff for the holidays right now and see how all my other East v. West girls styled their LuLu's picks! um, how did i not see those pants?? i love how the outfit came together!! Such a cute look! I love the embellished top under the blazer. And the red clutch is just the right amount of color.